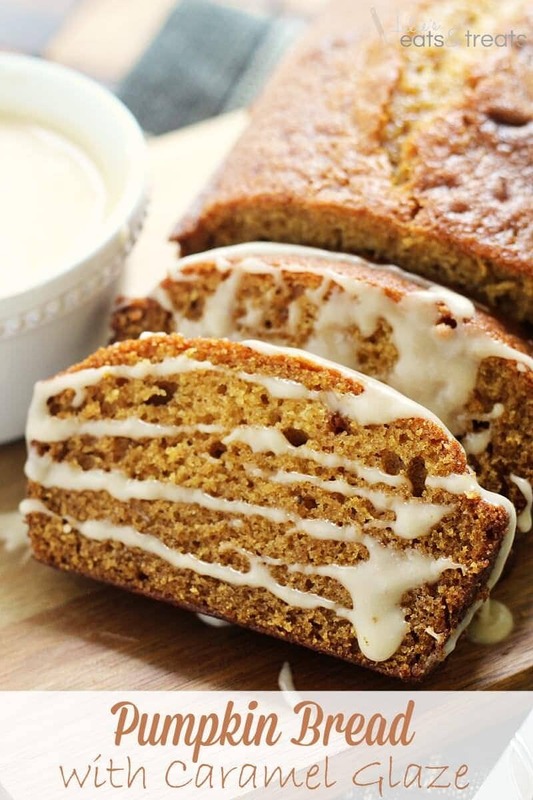 I know, I know you already have a recipe for a pumpkin bar right? I mean it’s so overdone and plain old unoriginal. I even thought to myself why on earth am I going to share this on the blog? Sure I added in some cinnamon to the cream cheese frosting, but really that’s not totally special. I’m sure it’s been done a million times before. But honestly these are epic. As in everyone that has them asks for the recipe because it’s better than any pumpkin bar they have ever had. Hands down it kicks all pumpkin bars butts and you’ll throw all previous recipes out the doors. My friends, trust me. 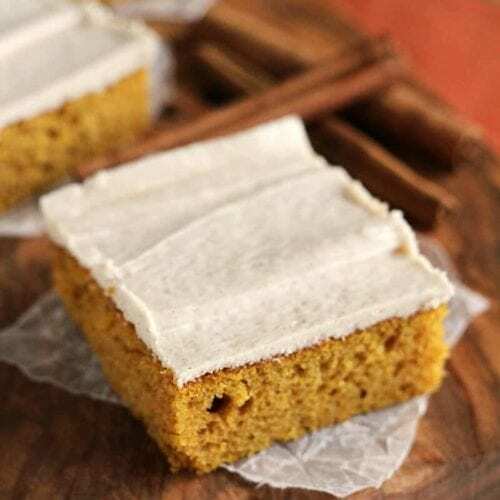 As you go to get your trusty old pumpkin bar recipe out give these some love and give them a try. You’ll have no regrets. For example they would a wonderful treat while you are snowed under in Minnesota which is currently happening as you look out the window if the forecasters were right. Yup, snow. Ugh. We went from this amazing October full of sunshine and warmth to a predict winter storm full of snow, snow and more snow. Let’s just say 8-12 inches of snow. And then because it can’t ever just snow it’s going to start blowing that lovely snow around and cause white out conditions. And then Julie will go into labor. Her midwife will not be able to go to the hospital because she lives out of town and Julie will be stuck in the hands of some unknown doctor. But really if that does happen I’ll probably just care that they deliver that child and get the show on the road! Hopefully this does not happen considering I’m still about two weeks from my due date, but of course I think of all these crazy possibilities. My guess is still overdue and giving birth on Thanksgiving. You know cause that will be totally awesome. So as we countdown the days until I get to share a cute new bundle with you we should all grab the pumpkin and make these bars and learn that Julie has lead you in the right direction once again. And then you can all say that I rock and I’ll say at least in this case I do! If you are looking for a sweet fall treat this is the perfect treat for you! In a large mixing bowl beat together eggs, sugar, oil and pumpkin until light and fluffy. Mix in dry ingredients until combined. Spread in ungreased 10x15 inch pan. Bake for 20-25 minutes or until they test done. Cool. For the frosting cream together cream cheese, butter and vanilla until smooth in mixing bowl. Gradually add in powdered sugar and cinnamon while mixing. Spread over cooled bars. Looking for more Pumpkin Treats? Pumpkin Bread with Caramel Glaze ~ The Perfect Pumpkin Bread Topped with a To-Die-For Caramel Glaze! Pumpkin Angel Food Cake ~ Light, Airy Angel Food Cake with a Hint of Pumpkin! Cinnamon Frosted Pumpkin Cookies ~ Soft, Chewy Pumpkin Cookies Topped with Light and Fluffy Cinnamon Frosting! There’s nothing like cinnamon cream cheese frosting! Love it! The snow sounds crazy there. The baby better not get any crazy ideas. Hang tight for two more weeks little one! 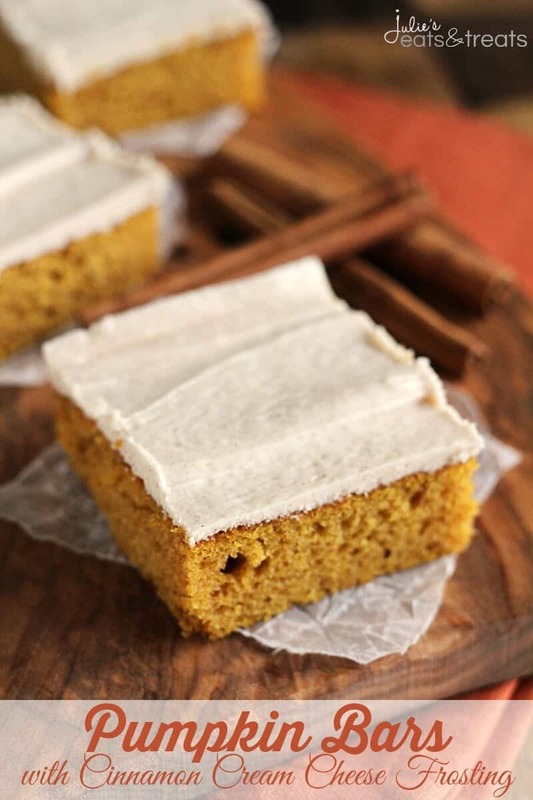 Your pumpkin bars look perfect! Pinning these for later. Overdone? Who cares, I will gladly take one of these puppies! These look wonderful. I love the idea of cinnamon added to the frosting. I will take a pumpkin bar ay day! Snow!! Oh no! My son was born in February and my fear was not being able to get to the hospital because of snow, I totally understand! And yes, these bars are epic indeed! Yikes, snow? Hope you are staying warm and cozy. I am keeping my fingers crossed that it’s nice and dry outside when it’s time for the baby to arrive. And these bars look perfect! 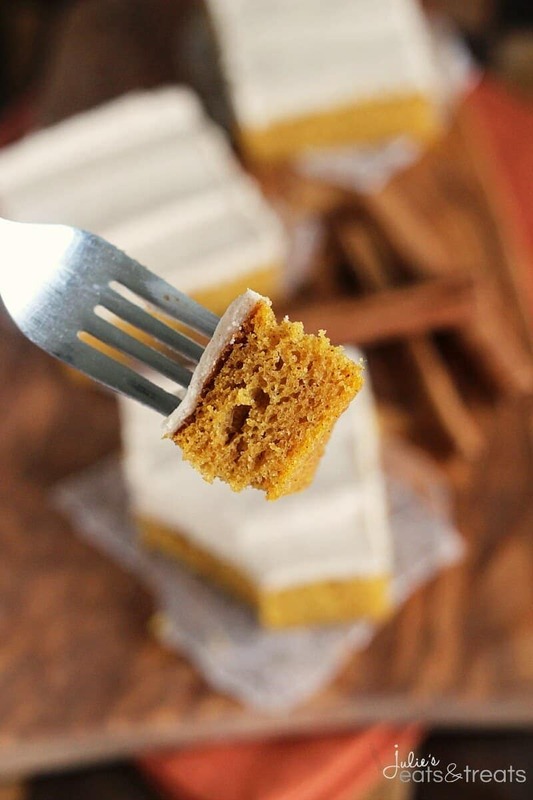 Love the cinnamon cream cheese frosting – you can never have too many pumpkin bars 🙂 Pinning! Yum! I love sweets, I am also inlove in baking but with my busy schedule, I don’t have the time to prepare one. Good thing I am living in a city that’s surrounded by great restaurants.. There are many restaurants in hong kong that serve foods ad desserts that can make you feel like you are dining around the world. haha. Mott 32 (http://www.mott32.com/) is one of those, it’s a family’s favorite. I recommend you to try their green tea mousse with chocolate fillings. But anyway, thanks for the recipe, maybe I can prepare this on my spare time. 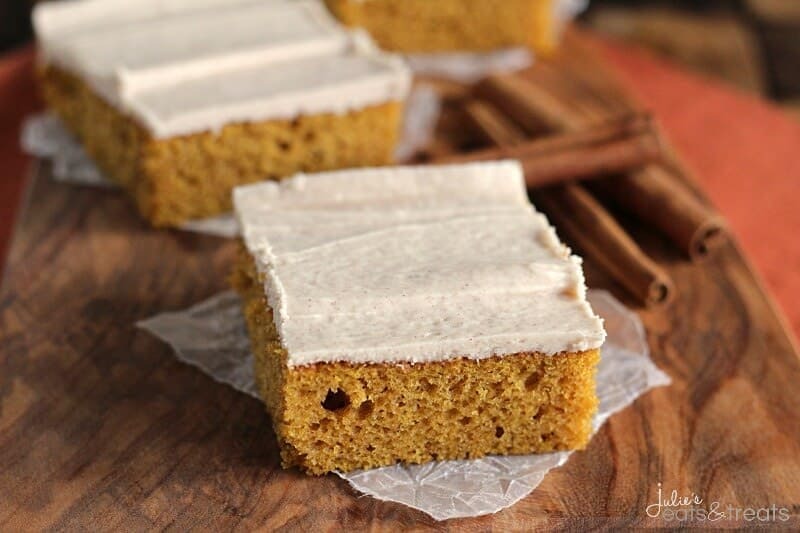 I absolutely want to bake your pumpkin Bars with Homemade Cinnamon Cream Cheese frosting. My Husband would love it.I Pinned it . Can’t wait to make it.. Thankyou for your recipe..
Hope you enjoy it Cathy!